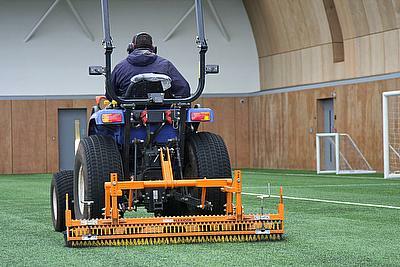 Tottenham Hotspur FC grounds manager Darren Baldwin has chosen a SISIS tractor mounted brush combination of a Zig Zag brush and Flexibcomb which have been fitted to a Twinplay frame for use on both the synthetic and natural surfaces at the club’s new training ground in Enfield. As grounds manager, Darren is responsible for both the training ground and stadium pitch at White Hart Lane, overseeing a team of over 20. Part of his day-to-day duties include the maintenance of both the one and a half outdoor and one 70 x 50 metre indoor synthetic pitches at the training ground, which are used 7-days-a-week. 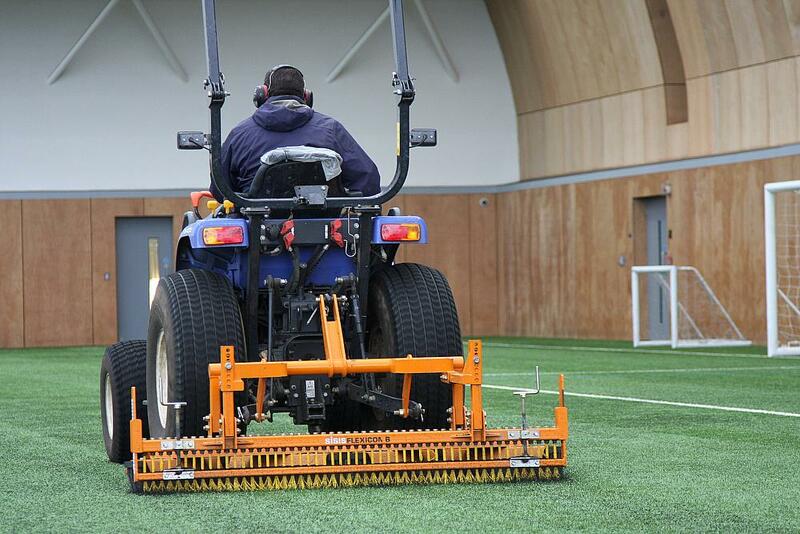 With that amount of activity; it is vitally important a regular maintenance programme is followed to keep the synthetic surfaces in tip-top condition at all times. This involves a combination of light or heavy brushes to even out the distribution of rubber crumb on a daily basis. depending on the chosen setting, be used as a brush or as a rake – versatility which has impressed Darren. “The SISIS brushes are so simple to use. There are times when we need to de-compact the synthetic surface which requires a stiffer setting and there are other times where we are just looking for a light brush over of the surface, but it only takes minutes to adjust. The system is very quick and keeps presentation of the surface very high. The best feature on the SISIS synthetic equipment is its flexibility. The Zig Zag brush is very important at the front to even out the rubber crumb before the Flexicomb comes behind and is brilliant at standing up the fibres and evenly distributing the rubber infill.